Melasma is a skin condition in which dark patches develop on both sides of the face. The distribution of patches is symmetrical and most commonly appears on the forehead, cheeks, nose, upper lip and chin. It will not spread to other areas of the body and it is not contagious. The patches are caused by increased amounts of melanin (skin pigment) in the skin. The excess melanin may be located in the top layer of the skin (epidermis), in the middle layer (dermis), or both. The location of the pigment is an important factor when considering treatment options. The condition may run in families and occurs mainly in women of child-bearing age. The condition has also been called the “mask of pregnancy,” as it tends to appear during pregnancy. After pregnancy, the mask often fades but may recur with subsequent pregnancies. Melasma is also more common in people with darker skin types, especially Hispanics and Asians. Though the mechanisms that trigger melasma are still under investigation, there appears to be a direct relationship with female hormonal activity, as the condition is common among women who are pregnant and those who use oral contraceptives. Certain medications or cosmetics may also cause skin darkening. Sometimes a thyroid gland dysfunction can contribute to the condition. The most important cause appears to be sunlight exposure. The ultraviolet radiation in sunlight stimulates the overactive melanocytes to produce more melanin than the normal melanocytes in surrounding skin. Further exposure of the affected patches can cause additional darkening and, during treatment, can cause potentially successful treatments to fail. 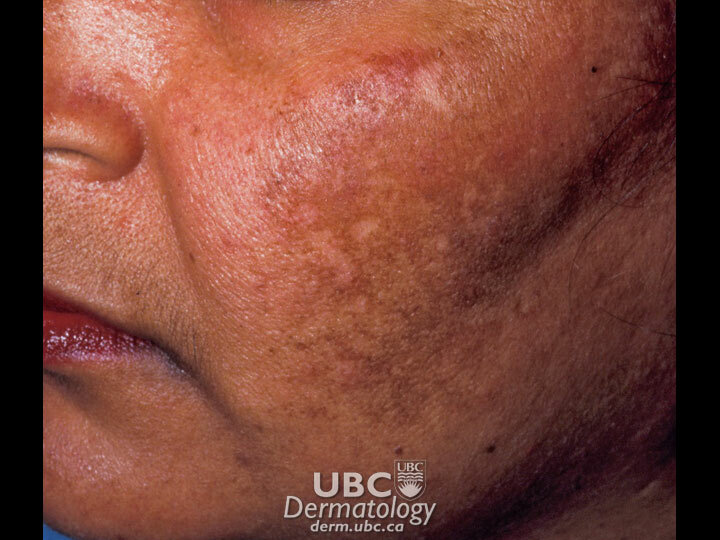 Some individuals may have a genetic susceptibility to developing melasma. More than 30 per cent of people with melasma have a family history of it, and there are reports of the condition affecting identical twins but not other siblings under similar living conditions. In general, the condition tends to persist, though treatments are available to gradually lighten the darkened skin. Melanin is responsible for the natural colour of our hair, eyes, and skin. There are two main types: eumelanin (dark) and pheomelanin (golden yellow). The dark melanins protect our skin. When our skin is exposed to sunlight, our bodies produce melanin, which enters cells and positions itself between the sunlight’s UV rays and the centre of the cell to protect it from damage. Melanin is produced by cells called melanocytes, which make up the majority of cells in the epidermis, the outer-most layer of our skin. 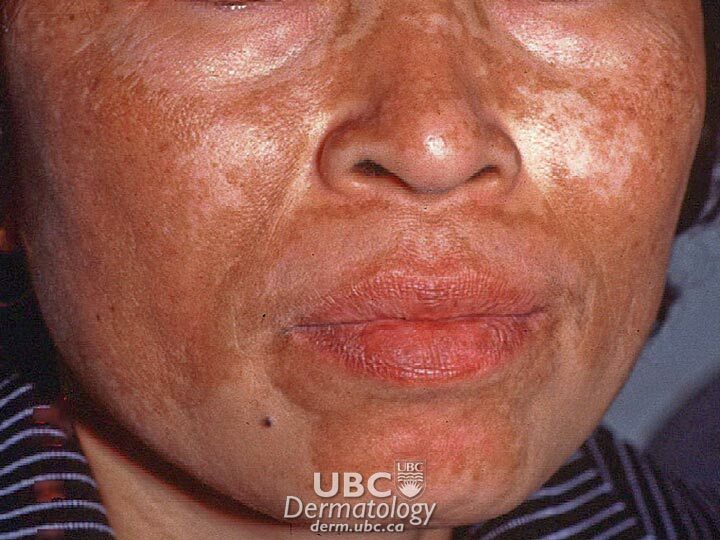 Melasma mainly affects women in their childbearing years. According to one report, 50-70 per cent of pregnant women develop some degree of melasma. The incidence in pregnant Hispanic women may be as high as 80 per cent. Men are affected in just 10 per cent of cases.